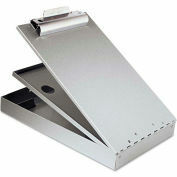 Provides a Level of Performance and Affordability Unmatched on the Market! 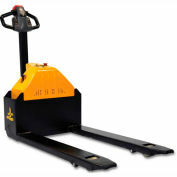 Lift and lower pallet loads quickly and easily with a push of a button. 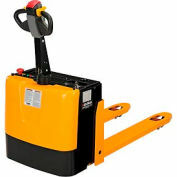 Fully powered Pallet Jack maneuvers loads up ramps and inside trailers. 24V DC Curtis transistor travel control with high-torque permanent magnet drive motor is designed for industrial use. 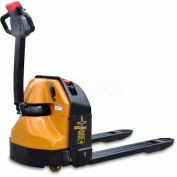 Ergonomic handle features dual butterfly thumb controls with infinite forward and reverse speeds, lift/lower controls, safety belly reverse button, and horn. 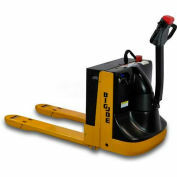 Electromagnetic disc brake with automatic dead-man feature activates when the operator releases the handle. Reinforced 6" welded forks for years of service. 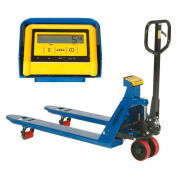 Includes battery, integral battery charger, battery level gauge and emergency battery disconnect. 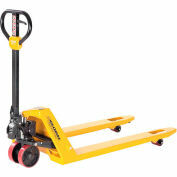 Rolls smoothly on polyurethane steer and load wheels. 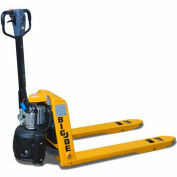 Features 0.65 KW drive and 0.84 KW lift motors, 3.15" lowered and 7.5" raised heights. 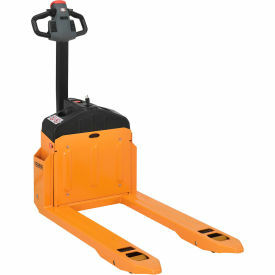 Electric Pallet Jack offers a minimum of 4.8 hours service per charge. 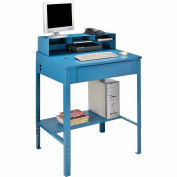 Designed and tested to offer years of reliable service. 1 Year Limited Warranty. Your review: The new Pallet Jack appears to be great. I say this because We literally received it in less than a week. 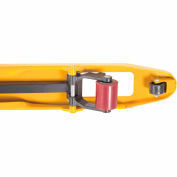 We've used it a couple of times which was fantastic . Cons: It took almost a month to deliver. What is the lifetime of this pallet jack? Hello Josh. 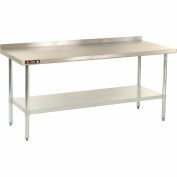 This unit has been thoroughly designed and tested to offer years of service. Thank you for your interest in our product. 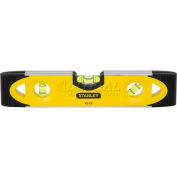 What are the shipping dimensions and weight of this product? 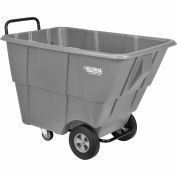 Hello Chris, the shipping dimensions are 70.8"L x 27.5"W x 31.5"H with a weight of 520 lbs. Thank you for your interest in our product. What is the highest incline grade this unit is rated at under load? Hello Alex, we recommend no more than a 2% gradient on this unit. Thank you for your interest in our product.